The battery has 2,330mAh capacity, a bit more than the Galaxy S4 mini got and not bad for a point-and shoot camera. Keep in mind that most such cameras don't have active radios, which can drain the battery pretty quick. Note that the unit Samsung sent us (a retail unit according to company) had a battery labeled "2,130mAh", but the official specs of the Galaxy S4 zoom say 2,330mAh battery capacity. 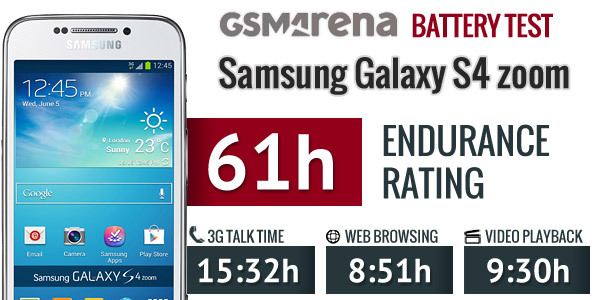 The Samsung Galaxy S4 zoom scored a respectable endurance rating of 61 hours over the 54 hours of the S4 mini. The talk time was pretty good at 15 and a half hours, but the web browsing and video playback were both lower than the mini's times (by one and four hours respectively). 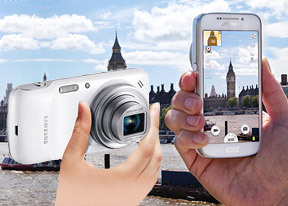 You can read more details about the Galaxy S4 zoom battery performance at our blog.